No matter what, we are always with you! Join us . Help you to find your happiness! No matter where you come from, what you are doing or what your confusions, difficulties or problems just Join us. Lets be your family in the foreign country. Our peer support counsellors and professional counsellors/psychologists will listen and advise. They will share the same language and culture with you. Our peer support group will provide you with a safe and open-minded place to talk and share you stories, experiences and feelings. Our interesting and helpful workshops and events can always provide you with a place to feel supported by family and friends. Enjoy your personalised life mentor, coach, counsellor, adviser and family during your time studying and living abroad. 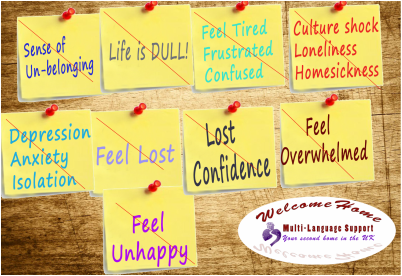 A place to share experiences with people from the same cultural background and who have experienced similar difficulties to you. "I was surprised at how different I have felt since I joined WelcomeHome, it helped to bring some colour back to my life! " "I am so glad to see there is finally someone who pays attention to us and really cares about us. Well done. Thanks !" "It just feels like being at home. Warm, cosy and comfortable :)"